Sometimes, the best apps are those that are really good at doing only one thing. Cross Forward Consulting’s InstaBackup (Mac App Store link) does just that. It’s a simple utility for Instagram users who want an easy way to back up their Instagram photos. The $1 app is a handy utility that’s well suited to Instagram power-users who want to back up their favorite lo-fi photos, or those who simply want a quick pain-free way to transfer their Instagram photos to their Mac. InstaBackup’s best feature is how easy it is to use. 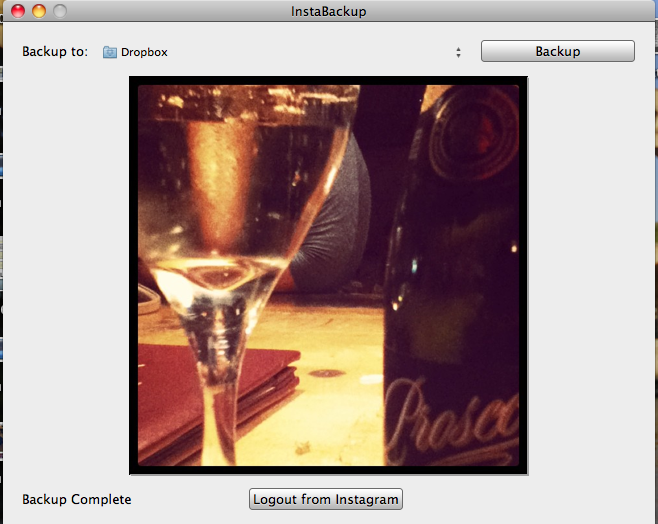 Simply log in with your Instagram account, choose a backup volume (you can choose an external device or a folder on your computer) and hit backup. The backup process takes only a few seconds, even with a few hundred photos. Once finished, photos appear in a folder tilted “InstaBackup” in the location you specified. It’s also an easy way to back them up to Dropbox if you use Dropbox’s desktop interface. While there are other ways to back up Instagram photos with Dropbox or other utilities, InstaBackup is by far the simplest and fastest one I’ve encountered. My only complaint is that subsequent backups do not merely back up the photos that were taken between now and the last time you backed up, as you may expect. Instead, your entire library is backed up again. This didn’t bother me too much, since Instagram photos are on the small side file-size wise, but it could be problematic depending on how many Instagram photos you take and how often you want to back up.